German Kittel raced clear to win the stage from Slovakia's Peter Sagan and Lithuania's Ramunas Navardauskas. However, the vast majority of the thousands of people lining the finishing straight in Harrogate were focused on Omega Pharma - Quick-Step rider Cavendish, who has a staggering 25 stage wins in the race. The 29-year-old Manxman spent several minutes on the floor before being helped back on to his bike and he gingerly rode over the finish line. He had been among the favourites to win the stage, which would have seen him wear the leader's yellow jersey for the first time. "He has never injured himself when he crashed, he has always bounced. "It's gutting to see, could Mark Cavendish have won it? He was in a position to do it. "This is like the Olympics for someone like Cav, but you cannot turn time back. It's done, and it will be a difficult one for him." "It's an unfortunate way to end what could have been a dream scenario," said Team Sky boss Sir Dave Brailsford, who has worked with Cavendish both on the road and track in his former role as head of British Cycling. "He's a great champion and he's done an awful lot for this country. He's one of the best cyclists we've ever produced, he's given us great moments of pleasure and I'm sure he'll get better soon." The Grand Depart was held in Yorkshire for the first time with more than one million fans estimated to have attended stage one. Police say 230,000 people were in Leeds and 10,000 more were on one of the climbs at Buttertubs. When told there was one million people lining the route, Brailsford added: "It looked like more to me. It was just incredible, fantastic. I've never seen so many people in my life. The amount of people was unreal. It's amazing that cycling can attract so many people." After a ceremonial start at Harewood House, with the Duchess of Cambridge cutting the ribbon to signal the beginning of the action, the race headed out into the Yorkshire Dales, reaching the northern-most point in its 111-year history in the village of Reeth. Veteran Jens Voigt, racing in his 17th and final Tour at the age of 42, led a breakaway from the start. Initially, it was a three-man attack with French duo Benoit Jarrier and Nicolas Edet, but German Voigt broke clear on his own after an intermediate sprint in Newbiggin and at one stage held a five-minute advantage over the 195 other riders in the race. "There will be a tense big race into the bottom of Holme Moss, which is a well-known climb from the Tour of Britain, to make sure you're in a decent position - we will want to be near the front with Chris Froome. "It comes just 60km from the finish and it will be full gas from there on in." He was eventually reeled in by the peloton with 60km (37 miles) to go in the 190.5km opener. The race geared up for a hotly contested sprint but Swiss Fabian Cancellara, who is more renowned as a one-day specialist rider, caused confusion when he launched a solo bid with 1km to go. The sprinters reacted and heading into the final straight, Cavendish collided with Orica GreenEdge's Australia rider Gerrans and both of them crashed to the ground. Team Sky's Chris Froome, who is the defending champion, finished safely in sixth place. Team-mate Geraint Thomas was 17th, with the fourth Briton Simon Yates 61st, all given the same time behind Giant-Shimano's Kittel. Brailsford said: "The first stage of the Tour is about getting through unscathed; Froomey finished sixth. Job completed." For Kittel, it was a fifth stage win and a repeat of last year's opening stage victory in Corsica. "I am incredibly proud of this victory," he said. "It happened pretty easily. It was like coming out of a tunnel. I was able to accelerate like never before. It's really awesome. Deja vu, yeah." Sunday's second stage runs 201km from York to Sheffield and features around 3,000m of climbing, spread across nine categorised ascents. Mark Cavendish was all smiles at the start, shaking hands with Andre Griepel in between Alberto Contador and 2013 winner Chris Froome. The Duke and Duchess of Cambridge and Prince Harry got the race under way at Harewood House. An estimated one million people watched along stage one's route. Trek's Jens Voigt, at 42 the Tour's oldest rider, led for much of stage one. 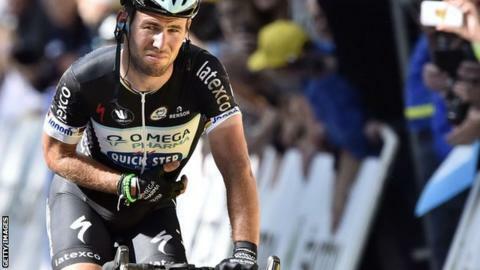 Cavendish was taken to hospital following treatment near the finish.